Major General Steven Cray announces a deployment to the Middle East. Behind him, from left, are Col. Patrick Guinee, governor-elect Phil Scott and U.S. Rep. Peter Welch (D-Vt.). A few hundred members of the Vermont Air National Guard will deploy overseas in the coming weeks on an open-ended mission under the command responsible for Middle East combat operations. The "short notice" deployment of members of the 158th Fighter Wing will likely last a "few months," Major General Steven Cray said Tuesday. The airmen will report to U.S. Central Command — which is responsible for the Middle East, Northern Africa and Central Asia — and is overseeing the fight against the Islamic State, among other initiatives. The mission will "bring the fight to our enemies," Cray said. Vermont officials were recently notified a deploy order could come before Christmas. Confirmation came Monday night, Cray said, and the deployment will happen sometime in the next few weeks. The 158th Fighter Wing has 1,100 members. Roughly 100 are already deployed overseas on other missions, officials said. 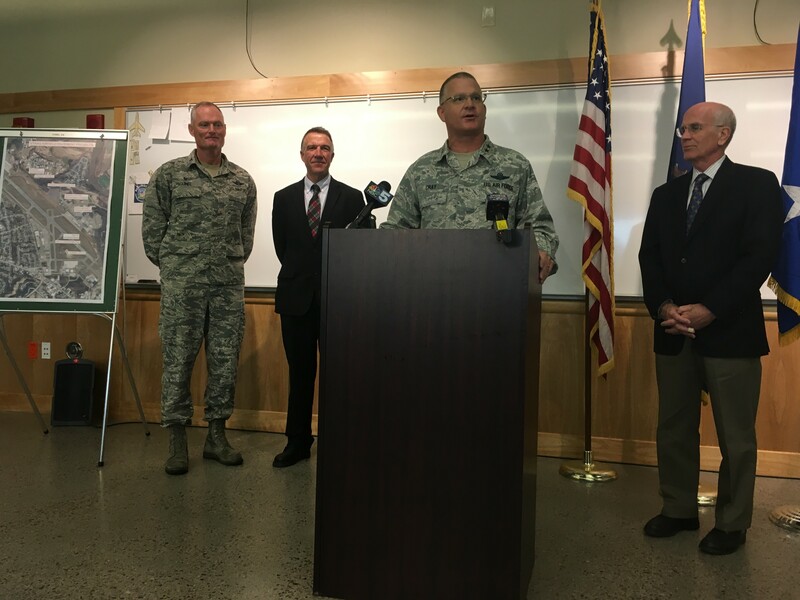 The latest deployment of the Green Mountain Boys will include F-16 fighter pilots, maintenance, intelligence and support crew. Cray and others declined to give specifics on the deployment and location, citing security concerns and rapidly unfolding plans. "I asked [Vermont guard personnel] to find a way to say 'yes,'" said Col. Patrick Guinee. Within hours of the request, the Vermont Air National Guard had enough volunteers to fulfill its mission, he added. U.S. Rep. Peter Welch (D-Vt.) and governor-elect Phil Scott attended the press conference announcing the deployment. Sen. Patrick Leahy (D-Vt.) and Sen. Bernie Sanders (I-Vt.) released statements wishing the airmen well. The deployment will likely be ongoing as president-elect Donald Trump takes office in January. Trump has offered few specifics about his future military strategy. "The American people chose him, so we've got to hope for the best," Welch said in response to a reporter's question. "He doesn't have any experience. Let's hope he gets some good advice." Separately, the guard announced that it is breaking ground on a $39 million project to repave the airfield at its base at the Burlington International Airport. Taxiways and aprons first built in the 1950s will be repaved during the two-year project. Air National Guard members and F-16 jets may have to temporarily relocate to bases outside of Vermont for weeks or months at a time to accommodate the repaving, officials said. The project will help prepare for the arrival of the controversial F-35s. Eighteen of the next-generation fighter jets, which opponents say will increase noise in the Burlington and Winooski area, are scheduled to replace the F-16s in 2019. Kubricky Construction won the bid for the project. The Wilton, N.Y., company plans to use five Vermont contractors and three Vermont suppliers, meaning more than 100 Green Mountain State employees will work on the project, Scott said. "No new house can be built without a solid foundation," Scott said.